Christendom College will join with the Diocese of Arlington’s Bishop Burbidge for a prayerful protest of abortion on Saturday, April 6. The event, hosted by the Diocese of Arlington’s Respect Life office, will begin with Mass at 8:00 a.m. at Queen of the Apostles Church, with a rosary said in front of a metropolitan abortion clinic soon after. The Diocese of Arlington personally invited Christendom’s Shield of Roses student pro-life group to the event in January, with Bishop Burbidge hoping that Christendom could attend. Shield of Roses, which sends students into Northern Virginia every Saturday morning during the academic year to protest abortion, was thrilled at the invitation and jumped at the opportunity. 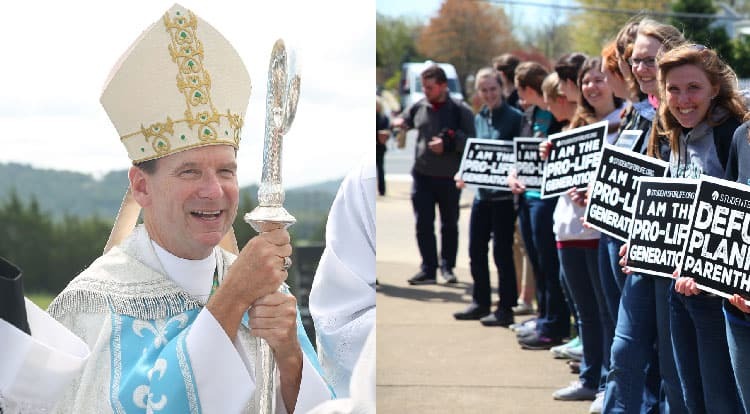 Bishop Burbidge has attended Shield of Roses events in the past, making this event another exciting opportunity for Christendom students to participate in the pro-life fight with Christendom’s home bishop. Sophomore Elizabeth Eller is one of the presidents of Shield of Roses and sees the event as one of the most important for students to take part in. The Diocese of Arlington is chartering a bus for Christendom students to attend the event as well, making sure that students, faculty, and staff can be together for the entire event. Students interested in attending the event are encouraged to email Eller at elizabeth.eller@christendom.edu or sign-up in the back of St. Lawrence Commons by Sunday, March 24.